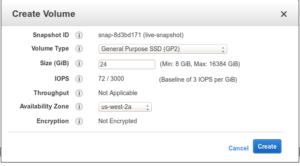 Amazon EC2 – Increase memory limit for instance. Once your snapshot is ready you can create volume based on that snapshot. Select your snapshot and click on create volume. Pop-up will ask to select volume type, size, availability zone. Make sure you select proper zone where your instance. After setting proper options click on create button. Now you can check volume is available in volume section with available state as it is not attached with any other instance. Now right click on volume which is currently attached to your stopped instance and select option detach volume. This will detach current volume from your instance and available to attach new volume. Right click on volume which you want to use (which we have created with bigger volume) and select option attach volume. It will ask to select instance. Just select your stopped instance and click on attach button. Now right click on your stopped instance and start that again.